Ekamra Kshetra - The Temple City, Bhubaneswar is part of the Tentative list of India in order to qualify for inclusion in the World Heritage List. Ekamra Kshetra is the old town of Bubhaneswar. It contains nearly a hundred temples according to the map I saw on one of the buildings, with the offices document stating 199 and there used to be 700. Getting around is easy on foot if you want but be prepared to take the whole day. I found that most of them are very, very similar but maybe I'm just ignorant. I had a driver/guide for half a day which would be continue to then Sun Temple and end at Chiliak lake mid-evening. I also went to Dhauli up on a hill on the outskirts and its popularity was even more than the town. I think it is part of the nomination as well and has a fancy Ashuka pillar nearby as well. In most temples the people are inviting to enter freely. It often takes more effort to wear/remove shoes than look at the temple structures because they can be so small. It being sandstone they have eroded a lot and the simple gates aren't exactly security, but I believe the locals really respect their heritage. Some of the better temples are Rajarani and Muktesvara (which the guide kept pronouncing differently for some reason). There is, however, one temple that stands out. 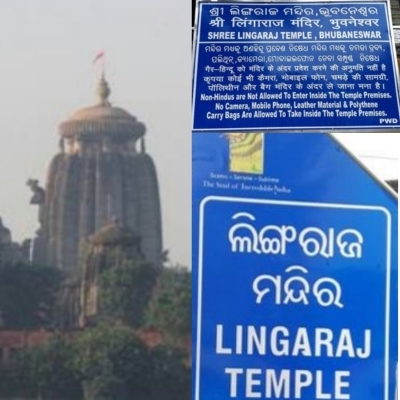 Lingaraj is the biggest temple at Bubhaneswar smack in the middle of old town. I'll come right to be main problem: chances are you can't go inside. It is only for Hindu. Security will smell tourists from miles away, or more likely see a white face with photo camera slung around the shoulder and know you aren't here for worshipping. There are no phones and cameras allowed inside anyway, not any bag, and storing stuff at the lockers isn't free, so don't even show up with any. There was a case of an Indian celebrity getting accused and fined for shooting pictures inside quite recently. God knows how she got to keep her phone. Alright so what the guide told me is to look the part: get a tilaka, wear some garlands over a dress (obviously easier for girls) and go in with at least one more person who speaks Hindi to back you up. I don't really want to encourage it but in my opinion if one respects the site and religion and blends in it doesn't do much harm. Like most small temples in the area it features artisan's carvings at every corner including some “Kama sutra” ones. If you mainly care to see that and haven't seen enough on your India journey yet then consider if the smaller temples aren't enough to see. The surrounding wall contains several sub-temples to explore, with some less popular than others. The guide told me not to to stare around like a tourist so the entire time was more of a sneaky affair that I wanted over with quickly. Imagine being in Mecca and scared to be found out, just not as bad. If you don't go inside you can get a decent view from the lake. The biggest tower also gets the most attention inside even without the extra selfie posers. Whereas I don't quite fully understand its significance of temples, there are already many similar inscriptions for other religions that seem similar in sacred houses. I was reading that the inscriptions should be accessed by tourists but it only came from the newspapers, yet I could see this having a low priority for India with the lack of tourism boost it would get. There were several tourists in the temples around town already and I don't think guests will always know it's off-limits to visit until arrival - I know I didn't. One can still expire and enjoy plenty of the other temples and the caves.